General Instructions: Plant Lily Bulbs Immediately upon Receipt Lily bulbs are never completely dormant and need to be planted as soon as possible. You can delay planting for 2-3 weeks by keeping the bulbs in a cool, not frozen (34-40° F.), area of a garage, basement or refrigerator, but longer and you risk bulb damage. You must open the shipping box to check your order and then re-close any plastic bags before short term storage. Our packing material protects your bulbs and absorbs excessive moisture, but if large water droplets form within the plastic bag, poke more “air” holes in the sides of the poly bag, being careful to not damage your sleeping bulbs. Lily bulbs are happiest in the garden where they can begin growing new roots immediately. Choose an area with good air circulation and well-drained soil. Waterlogged soils, with poor drainage or too much “organics” in the soil mean certain death to lily bulbs. A sloping site with natural drainage is best. When planting in heavy clay, try mixing Perlite (the white crunchy stuff found in commercial potting soil – not Vermiculite that holds moisture) or sand with the native soil to create raised beds 8 to 10 inches above ground level, or make raised beds of garden-safe, treated wood. If bothered by moles, mice or gophers nail 1/4-inch galvanized hardware cloth on the bottom of the framework before you backfill with good soil. Sandy loam soils rich in humus with a pH of 5.5-6.5 are ideal. Lilies look most natural planted in triangular groups of three, spaced 12”-18” apart. Provide at least 6 hours of sun, dappled shade in very warm regions for Orientals. Cover bulbs with fluffy soil and mulch to control weeds and maintain even ground moisture. Plant at a depth of 2 to 2 1/2 times the height of the bulb. Generally this means about 5 inches of soil over the top of Asiatics, 6 inches over the top of Orientals and Trumpets, and 7 inches over to top of Orienpets. Plant bulbs 2”- 4” deeper in areas where daily temperatures average over 90 degrees F. and the soil is sandy to help keep bulbs cool during the summer months. Do not plant among aggressive ground covers or where large trees or shrubs will rob nutrients or moisture. Lily bulbs need regular fertilizer, water, and cultivation. They do NOT “naturalize” like Daffodils or Tulips, which have a hard outer shell. Be sure to mulch bulbs in cold climates if a good winter snow cover is not expected. Likewise, in more temperate areas, cold saturated soil will rot lily bulbs some years, so a raised area and fast-draining soil is recommended. Common mistakes in Cold Climates #1 - Not mulching Oriental & Trumpets types each winter. #2 - Mulching before the soil freezes. #3 – Leaving mulch on garden too long in spring. Although more moderate climates only require enough mulch (one to two inches) to reduce winter weed germination, colder climates need a bit more attention, in the same way that roses and other "softer" perennials are protected. During a recent winter, some areas of Wisconsin, Minnesota and Illinois experienced very cold temperatures, with frost levels greater than 5 feet, and without enough snow cover for many plants. The loss of rose bushes, trees, shrubs and other "above ground" plants is a tough one to avoid, but protecting lily bulbs under such conditions is easy if the ground is mulched. You MUST place an insulating layer of mulch over all Trumpet, Oriental, OT Hybrids or species where gardens are subject to deep freezes, especially if a good snow cover is lacking or not expected. Asiatic lilies do not generally need extra protection, but all other lily bulbs in the Midwest, or Mountain states need to be covered. If established lilies are planted at the top of a ridge or small hill, the cold will not settle around them as much, so those areas may get by on a lesser amount of mulch, but soggy, wet areas are to be avoided. A good layer of mulch may consist of 8 to 12 inches of straw or hay, tree boughs or other fluffy material. Avoid compacted leaves or grass clippings, this will hold too much moisture and possibly rot the bulbs in spring. Remove the mulch in layers, as the ground thaws and warms. If you do not, the ground will not evaporate rainfall (or snow melt) fast enough in spring and your bulbs most likely will rot instead of sprout. Soil stays wet and even though there may be occasional 'sun breaks" throughout May, copious amounts of rain will not allow soil under mulch to properly dry. Lilies in raised beds will so the best because the drainage tends to be better, with nice green leaves all the way to the ground, but in lower planting areas you may see classic signs of over watering if there is a thick layer of mulch over the bulbs. In USDA Zones 7 to 9, lilies do not need a winter layer of bark or other materials to protect your bulbs from freezing, but rather a light mulch to simply keep winter weeds from germinating. In areas with slower drainage the bottom leaves on lily bulbs will yellow and drop off, which seriously cut into their ability to manufacture food and replenish themselves for next year's bloom. Those bulbs that lose their leaves early may take two years to recover. Try to maintain good air circulation around lily stems, to help the foliage to dry between rains and to reduce the incidence of Botrytis , a fungus. Where daytime temperatures are consistently 90° and above, but the soil remains cool, plant all lily bulbs in full sun so they will receive enough heat to mature before winter. 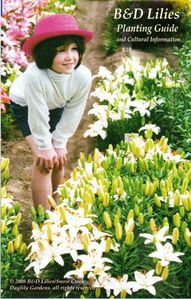 Asiatic lilies can handle 100° summers and -40° winters without special winter care, but you should always mulch Trumpets and early-blooming Orientals after the ground freezes, to discourage any rodents from taking up residence and to provide a blanket of insulation for the coldest months. If winter low temperatures stay well above 40° F, dig and refrigerate lily bulbs for 8-10 weeks to provide an artificial winter. Lilies received from us in spring are pre-chilled, fall delivered varieties may require additional cold treatment if received before Mid November. Protect from "freeze-thaw" and excessive moisture Any container that contains lily bulbs needs to be insulated from rapid freezing and thawing. Failure to do so may result in rotted bulbs over winter. Although your bulbs can be perfectly hardy in the garden where ground temperatures fall and rise slowly over many days, unprotected pots can freeze solid within one hour. Surround the containers in sawdust or hay after the ground freezes, place them in a root cellar, or move to an unheated garage for the winter. Do not bury the pots in the ground for they will not be able to drain excess water properly, especially in early spring; the drain holes will rapidly become plugged and the pots will act as a sump, catching, rather than draining away, excess moisture. In the Pacific Northwest, winter comes and goes; we might be sunny and warm one day and frozen the next, with rain, sleet, snow or hail in between. The most important thing to avoid with our varying weather patterns both here and across the USA, is to not allow containerized lily bulbs to become saturated in their pots. Simply placing pots under an overhang, deck or covered porch, out of direct sun, is sufficient for most areas that rarely go below 15 degrees F. in winter. Placing pots on their side on the north side of a shed or garage also works rather well to keep off winter rain in milder climates, just remember to set them upright when sprouts emerge. Please remember that our guarantee for winter hardiness does not cover potted lilies, so be sure to protect your lovely lilies over winter or transplant them into the garden this fall.